Some people don't like picking strawberries, but our Agents don't mind it. Keraina Talie-Kuo and Krominal spotted a fail-fit Hulk operating in a quiet little system. They terminated it. Surprise! The Hulk was part of a little strawberry patch of mining alts. One of them spoke up. It was Doctor Schutz, whose similarly named alt Dr Schutz had previously been the subject of a minor study. The mad doctor had originally been persuaded to support the New Order, but when his permit was revoked for AFK mining not long afterward, he underwent a Jekyll-to-Hyde transformation. Now it was time for the doctor to get his check-up. Agent Kalorned and his ganker alts had provided Doctor Schutz with a surprise follow-up examination. Despite having several months to reflect on his failings, Schutz showed no signs of warming to the New Order. It was as if he believed the answer to life's problems was mining in highsec, rather than obeying the Code. He had a peculiar philosophy. Schutz was now an opponent of suicide ganking. He felt it was too "lame" to be considered content. AFK mining, on the other hand, was enough content to keep him paying four subscriptions each month. Doctor Schutz explained that his mining was superior to Kalorned's ganking because he could do it while performing his real-life job. Assuming someone employs Doctor Schutz, I'm sure they would agree that the two activities should be kept separate. Now the doctor began to psychoanalyze Agent Kalorned. Yet Kalorned was a happy, healthy citizen of the New Order. He'd just achieved self-actualization with a successful suicide gank. Schutz was the one with the dead Hulk and the attitude problem. Meanwhile, a stray pilot flew through local and cheered on the New Order. I remember when we only received jeers and threats in local. We're winning hearts and minds every day. Like many miners these days, Schutz was the recipient of multiple ganks from different Agents. While it's true that all of our Agents enforce the same Code, Schutz failed to appreciate all the unique little flourishes they add to the process. Doctor Schutz was working himself up into one of those angry soliloquies that rebel miners are famous for. 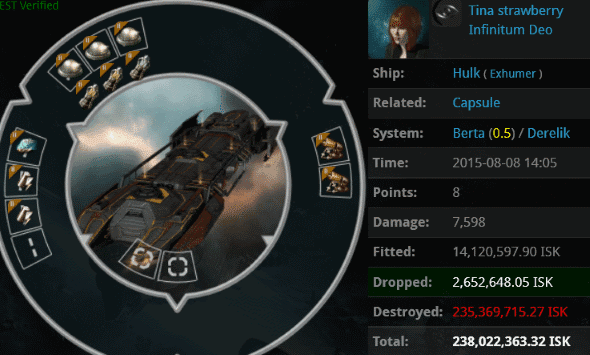 But suddenly his speech was cut short when Kalorned's alts landed on Dr Schutz's Covetor and also destroyed his 98 million isk pod. With any luck, the gank would knock Doctor Schutz back to his senses. Or would he only become even more detached from reality? An apple a day huh? A Permit today keeps the Gankers away. 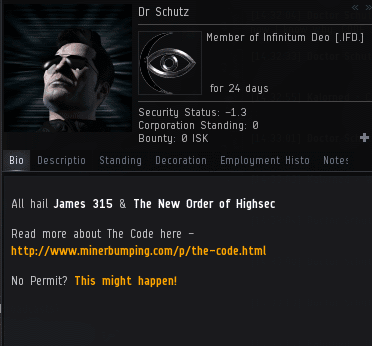 I have a feeling there's a wall of text in here somewhere from this miner who won't accept The Code, and pay his 10 million isk. I am also certain that his disregard of the Laws governing highsec will cost him more than 10 million isk. but why didnt Antiganking save the hulk? I assume it's because Antiganking is busy failing. Non-stop. Daily. Its interesting that you've again run into a group of AFK miners that you found previously. Before, you smacked them around and gave them a bloody nose. Now you've done it twice. Congrats. This is news? In a way I suppose it is, as in this post you're admitting failure. You failed to stop them earlier. I'm sure you're going to have an epic, 3 act play to describe the happenings, but I'm going to guess they didn't allow you to dominate them this time either. Well, of course you don't believe that bot-aspirancy can be defeated in a day, do you? We readily accept the fact that bot-aspirancy is, a resilient demon. It must be repeatedly beaten out of carebears until they move, pay, join, quit, or die. When one of those five things happens, the CODE wins. And we ALWAYS win. I'll just go ahead and note for the record that you admitted that CODE won, and then, we won again. By CODE's own admission, they're attacking the stupid, the foolish, and the ignorant. Of course they're going to win, they've set the bar so low people trip over it. Where do they admit that? Admittedly, we do set the bar very low. The price for a New Order Mining Permit is merely 10 million isk; a pittance by today's standards. We have not raised the price of a mining permit; nor do we ever intend to. The proverbial "bar" that you speak of is purposely kept low. 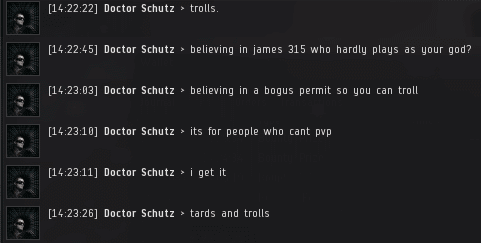 We want 100% of Highsec to recognize James 315 as their Supreme Protector and Saviour. We aren't going to get there if we charge every miner who wants to follow The Code 100 million isk. That's just not fair. However, as we continually see, miners, like yourself, refuse to make even the slightest effort toward living a Code-Compliant life. As such, we kill them until they do. Nobody said it was an easy, or rich life. But it is the righteous life. And it is the life we will continue until James 315 declares 100% of His space Code-Compliant. I'm kinda liking this new Black Abbot guy. He's redefining the Veers role by making it less about incoherent space lawyering and more about effete theater criticism. I wish him the best of luck in his message board war against the unstoppable might of the New Order. I would also wish him luck in actual battles with the New Order, but we all know he's the kind of guy who never undocks to participate in honorable PvP. As long as carebears are exposed to the truth, that violating the Code gets them nowhere, then we are winning. "ANOTHER lost ship and pod... I haven't recouped the last loss yet..."